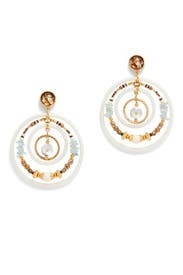 Dainty beads brings boho charm to these concentric hoop earrings by Gas Bijoux. Acetate and beaded drop hoops with 24k gold plated accents. Post backs for pierced ears. 3.5" long. 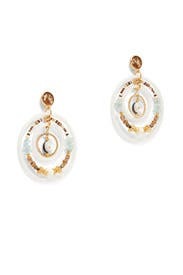 These earrings are beautiful but they are much larger than what you would think. I could tell they were going to hurt my ears after a couple hours. I never wore them and sent them back immediately.